The koma is the equivalent to the bridge on a guitar. It’s used to transmit the vibrations from the strings to the skin body of the instrument, so, if it’s wide, it will have a gentle tone, whereas if it’s narrow it will be higher. Furthermore, as the bridge gets higher, the pitch will get higher. As there are grooves cut into the koma to allow the three strings to pass through it, the position of the strings is strictly set. Also it is said, the thinner and lighter the koma, the more clear and lively the tone. However, you should understand that trying too hard will lead to problems of too much force coming out. There are many kinds of koma but, the shape, the material, the width, and the height are mostly decided for each genre. However, it depends on the ‘Ryu-Ha(school)’, and the preference in tone for the individual. Koma used in Jiuta and Gidayu have lead inset in their backs and it is thought that that provides their unique sound. At the bottom of the body of the shamisen is a large knot of silk cords to which the strings are threaded called the ne-o. If the koma is positioned towards the ne-o, the sound gets lower, whereas if it is positioned towards the middle the sound gets higher. The ideal position is said to be about three finger from the ne-o, and in many cases a performer will set the position so the koma does not move around during the performance. As mentioned earlier, the koma is one of the most important elements for determining the tone. To seek out the height and configuration for the sound you want is very intense. Typical koma materials are as follows. Naga-uta Cow bone or whalebone, known as shari (Buddha’s bone). High, at from 3-bu 3-rin (~10.5 mm) to 3-bu 6-rin (~11.5 mm), which makes a higher sound but makes it harder to play. Minyo Usually shari, but many people change to ivory for performances. 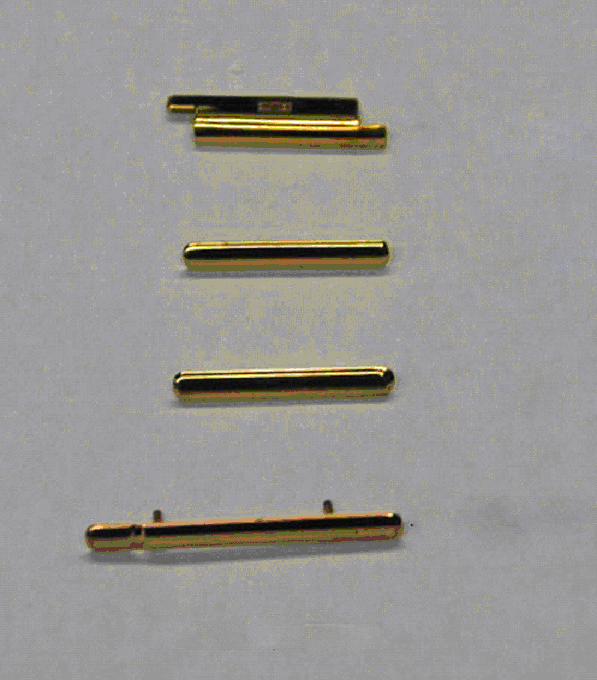 3-bu (~ 9.5 mm) to 3-bu 3-rin (~ 10.5 mm). Jiuta variations Water buffalo, with lead inside for its distinctive sound, or gold if expensive. Sometimes same as Naga-uta. Gidayu As above, water buffalo with lead. There are also plastic koma for practice, and ‘shinobi koma’ (stealth koma!) that are difficult to get sounds out of, and more recently acrylic and transparent materials. The size of koma is for height and width. Examples are written below. Dimensions are in the old Japanese measurement system. Even with koma of the same kind, the shape has some differences depending on personal preference and its style. Also, the fittings on the tenjin, the part of the neck in which the uppermost tuning peg is inserted (the head in English), are called the kamigoma, or ‘upper bridge’. There are two main shapes of upper bridge; an L-shaped cuff and a ‘Figure One’, or ‘bridge with feet’ (these are different styles of nuts in English). 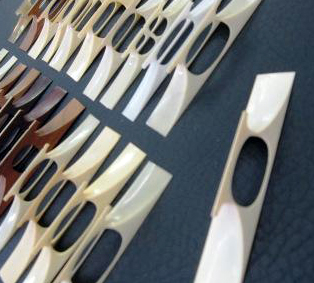 The L-shaped kind is usually used in thin-necked shamisen, old style medium-necked shamisen, and training shamisen. The bridge with feet has a small opening for the thin-necked shamisen, and a larger opening for the medium-necked ones, big enough to be able to shift one thread to one side. On top of that, for use with the Tsugaru shamisen and other so-called ‘Eastern style sawari’ shamisen, there is a groove cut for the first thread (sawari refers to any or all out of the positioning of the first thread against the soundboard so it causes a near constant humming vibration, the noise itself, and in some cases to the set-up of the fittings and equipment that enables production of that effect). Peculiar to the Gidayu style is the use of a bamboo koma. Both alloy and pure gold are also used, and typically it is a matter of the budget to decide. You should be warned, however, that if the material used is too thick or too soft, known as ‘high cutting’, the position of the thread on the upper bridge will slip and be prone to breaking.